Those who pay close attention to the more avant-garde leaning portion of the jazz scene, particularly the musicians based in New York City, will know that Mary Halvorson stays extremely busy. On top of constantly performing, be it with groups like the Tom Rainey Trio or her fantastic Octet, the guitarist has recently showed up on studio releases by Jason Moran (BANGS) and Tomas Fujiwara (Triple Double). This June, while in residency at City of Asylum in Pittsburgh, Thumbscrew, a band she is in with Fujiwara (drums) and Michael Formanek (bass) announced that they were recording two new albums to be released next year. Despite all this, Halvorson still managed to make some time to form a quartet to record the final volume of John Zorn's Book of Angels series: Paimon: The Book of Angels Volume 32. Zorn is a ridiculously prolific multi-instrumentalist and composer, whose presence and work, which includes the hectic and heralded Naked City, has been an important force in the world of experimental music for decades. The Book of Angels series, which started with Astaroth: Book of Angels Volume 1 by the Jamie Saft Trio in 2005, is the second of Zorn's Masada songbooks. Masada is a project which the composer undertook as a fusion of the musical legacy of his jewish heritage and his more modern, jazz-influenced experimental tendencies. As both musicians are frequently connected to hubs of avant-garde music like The Stone, where Zorn is the artistic director, it is extremely fitting that Halvorson, one of the most unique jazz guitarists today, was selected to provide the final pages to the Book of Angels. As the leader of the last volume of the Book of Angels, Halvorson is the closing act for over a decade of albums which have featured a wide range of musicians, including guitarist Pat Metheny and saxophonist Joe Lovano. 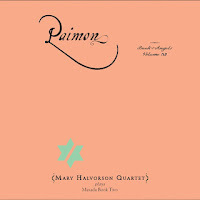 When put in historical context it may seem a bit daunting, however, the performance on Paimon: The Book of Angels Volume 32, shows that Fujiwara (drums), Miles Okazaki (guitar), Drew Gress (bass) and Halvorson were more than up to the task. Although odds are that a portion of the fanbase intersects, those who have come to Paimon more familiar with Halvorson's catalogue than with the Book of Angels are in for a treat. The Eastern-European-Klezmer-based compositional style that Zorn brings to his Book of Angels is radically different from the angular, occasionally hectic and searching style Halvorson brings to her own work on records like Away With You or Illusionary Sea. Zorn's compositions are generally shorter and more overtly structured than Halvorson's, with many songs here having themes that are brief, repeated phrases of notes that are often restated to close out the piece. The completely different compositional context Halvorson has inserted herself in here, combined with her idiosyncratic and adventurous way of playing guitar, makes for an extremely compelling listen. One of the most interesting aspects of Paimon is the interplay between Halvorson and Okazaki, who has a distinctly more slick, clean and relatively traditional guitar style in comparison to the band-leader's tendency to use her note-bending delay pedal and other effects. The sounds coming out of her guitar on this record range from ghastly, hazy tremolos ("Phul") to distorted walls of sound with electronic bleeps and bloops ("Beniel"). The clash of styles between the two guitarists creates a great juxtaposition, which is arguably at its peak when Halvorson takes a secondary role and comps behind Okazaki on tracks like "Ruhiel" and "Yeqon". At times, Halvorson's seemingly sporadic and impressive comping approach seems to suggest that the guitarist has taken a page out of the book of Thelonious Monk. On "Ruhiel" Halvorson takes the first solo, brilliantly bending and weaving her way around the main theme of the song, before lightly accompanying Okazaki's solo with a gorgeous distant echo effect. Whereas on "Yeqon", she accompanies Okazaki's hypnotic central theme at first by sliding up and down her guitar, giving the song a languid atmosphere. Halvorson eventually decides to comp more erratically on "Yeqon", occasionally quoting and warping the motif before breaking out into a strong solo in the third minute. Paimon is consistently engaging throughout its 42 minute run-time. The rhythm section of Fujiwara and Gress, although it is almost never in the spotlight, provides a solid backing for the two guitarists to express themselves. Fujiwara has a brief moment in the spotlight during a high-energy solo at the end of "Beniel", however, how the drummer gradually drives the tempo to extremely high-speed during "Dahariel" may be his finest moment on the record. Gress is featured during the calm "Verchiel", stepping into focus for a quality solo in the third minute of the tune. Although the brevity of the songs here means that Halvorson has less room to experiment with than usual, she is still no less interesting and the addition of Okazaki's highly accomplished playing makes certain that the space is used extremely well. Even though her eccentric style may still be an acquired taste for some, Halvorson's Paimon is an engrossing end to Zorn's Book of Angels.